The head of a UN team investigating US drone strikes in Pakistan has said that Islamabad does not consent to them and sees them as a territorial violation. Ben Emmerson was speaking after a research trip to Pakistan. However correspondents say the US could not launch drone strikes without tacit support from Pakistan. They add that privately officials from both countries speak of an understanding as to why the drone programme has been allowed to continue. It is estimated that between 2004 and 2013, CIA drone attacks in Pakistan killed up to 3,460 people. About 890 of them were civilians and the vast majority of strikes were carried out under the President Barack Obama's administration, the Research by the Bureau of Investigative Journalism says. US drones started targeting suspected al-Qaeda militants in Pakistan's tribal areas during President Musharraf's time. But it was during the five years of President Zardari's government that the attacks began sharply to escalate. Publicly, Pakistan's civil-military leadership fiercely denounces the use of American drones inside its territory. But privately, officials on both sides speak of an understanding why the CIA-run drone programme has been allowed to continue for so many years. US officials say targeted attacks are carried out based on local intelligence, often supplied by their Pakistani counterparts. As a result, it is not just the senior leadership of al-Qaeda that has been destroyed in Pakistan's tribal areas, but also the leading figures of the Pakistani Taliban responsible for organising some of the most audacious attacks and suicide bombings against the Pakistani state and its civilians. The US rarely comments on the details of drone strikes in Pakistan, but correspondents say that for many years Islamabad was allowed to launch them from bases within the country. American officials say privately that co-operation with Pakistan has not ended altogether - despite a cooling of relations - and key Pakistani military officers and civilian politicians continue to support the strikes. Documents released by WikiLeaks in 2010 showed that senior Pakistani officials consented to the strikes in secret to American diplomats, but at the same time condemned them in public. Mr Emmerson, a British lawyer, is a UN special rapporteur studying the impact of drone strikes in five places. He is examining attacks in 25 places in Pakistan, Afghanistan, Yemen, the Palestinian territories and Somalia. "The position of the government of Pakistan is quite clear,'' Mr Emmerson said on Friday. "It does not consent to the use of drones by the United States on its territory and it considers this to be a violation of Pakistan's sovereignty and territorial integrity." The drone campaign "involves the use of force on the territory of another state without its consent", he said. Furthermore Pakistan believes that drone strikes are radicalising a new generation of militants, he said, when it was capable of fighting Islamist extremists in the country by itself. The UN special rapporteur said that as a matter of international law, drone strikes were only lawful if they took place at the express request of the country concerned. Correspondents say that strikes in Pakistan are controversial because of the secrecy surrounding them and because they have caused significant civilian casualties - allegations denied by the United States. 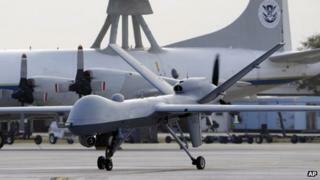 The UN investigation into drone strikes was launched in January and is expected to deliver its conclusions in October.